Monday was National Tell a Fairy Tale Day and I’ll let you in on a not so little secret, Beauty And The Beast is my favourite fairy tale. Or, more accurately, the more modern Disneyfied version of La Belle et La Bete written in the 18th century by French novelist Madame Gabrielle-Suzanne Barbot de Villeneuve is my favourite fairy tale. One would assume the older version of the fairy tale would be the more gruesome and deadly. Surprisingly, it’s not. 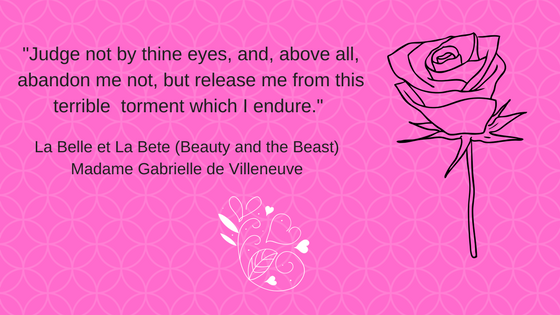 While the theme of learning to love, irregardless of appearances, is at the center of both tales, in the original the Beast is not being punished for a wrongdoing, he is the victim of an injustice. He refuses to marry his governess, an old and wrinkled evil fairy. so she curses him. A good fairy intervenes and promises a reversal of the evil spell if he can find someone to love his beastly self. She also camouflages the castle in a fog and puts everyone to sleep. Or turns them to stone, I can’t remember. Also, there is no deadline in the original fairy tale. No fading rose. But a rose does cause problems in the original, as Belle’s father picks one for her from the Beast’s garden, to which the Beast takes great exception. There is no Gaston, no Le Fou, no singing servants in the 18th century version. But there are costumed monkeys and birds. And, of course, both versions of the fairy tale include a courtship (with notable differences), and Belle does leave to visit her family in both versions. The Beast’s curse is broken in each and the handsome prince once again has his looks. But where the Disney version ends, the original has more to it. Mainly, a nasty mother-in-law who’s not impressed with her new daughter’s-in-law less than noble standing and a plot twist worthy of The Sixth Sense. Do you like fairy tales? Prefer the modern take on things or the original version? This entry was posted in Favorites, Reading, Romance, Uncategorized and tagged Beauty and the Beast, Fairy Tales, Karyn Good, La Belle et La Bete, National Fairy Tale Day, Romantic Suspense Author by Karyn Good. Bookmark the permalink.